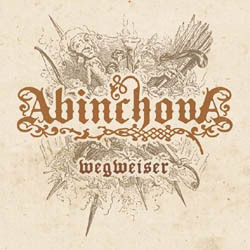 “Wegweiser” is the second full-length album of the Lucerne-based folk metal band Abinchova. Even if the first seeds date back in 2005, this Swiss band was officially formed in 2009, the same year that released its first EP “Hörensagen”. In 2011 Abinchova self-released their debut full-length album “Versteckte Pfade”, taking things in a much more professional level. In 2012 the 7″ single “Handgeschrieben” was out, once again self-released. For this new album, the band decided to start a crowd-funding campaign, something that is becoming quite popular recently. Finally the support of their fans helped them to release “Wegweiser” via the German label SAOL (Service for Artist Owned Labels). Abinchova once again show a great improvement in their sound, having an almost perfect crystal clear production. On the same time, there are also important differences in their music, at least for my ears. Their folk metal has now a much more technical approach, being closer to melodic death metal, clearly less influenced by epic metal compared to their previous works. What is also very important, is that they don’t resemble with another artist, since they have worked a lot to build their own personal identity. Their music is based on their technical multicolored melodic powerful guitars, which are equally influenced by folk tunes, classic heavy & epic metal riffs and melodic death metal. This time there are many classical music influences too, not only in their wonderful operatic female vocals, but also in their amazing guitar, violin and piano solos that have often an virtuosic mood. Vocals remain for sure the most extreme element of their sound, since Arnaud sings with passionate death black metal screams, in perfect contrast with Nora’s beautiful female operatic or folkish vocals. Their songs have many wonderful melodies that can stick in your head and at the same time each composition focuses on a different element of their music. Some of them are closer to folk metal, others sound more brutal, others more melodic; each one has something different to tell… There are totally 10 songs in the album, with a duration a little over 47 minutes. Of course I can’t tell that everything is perfect, since there are also a few indifferent moments in the compositions that I hope the band completely erase in the future. All their lyrics are in German, included in the beautiful CD booklet. While Abinchova started as an epic folk metal band, I believe that with this new album they actually redefine their music. Of course there are still folk and epic elements in their sound, but their music is far from the typical epic folk metal genre. I’m sure that “Wegweiser” will also appeal to a wider range of listeners that like melodic technical extreme metal in general. Except for the various digital formats, ”Wegweiser” is also released via SAOL in a nice digipak edition CD with 12-page booklet, printed in matte-paper. Layout and design is by their singer Arnaud Hilfiker, who proves to be quite talented in various forms of art. In the following links to their official pages you can listen to their entire discography and find all info you need in case you want to buy the CD.